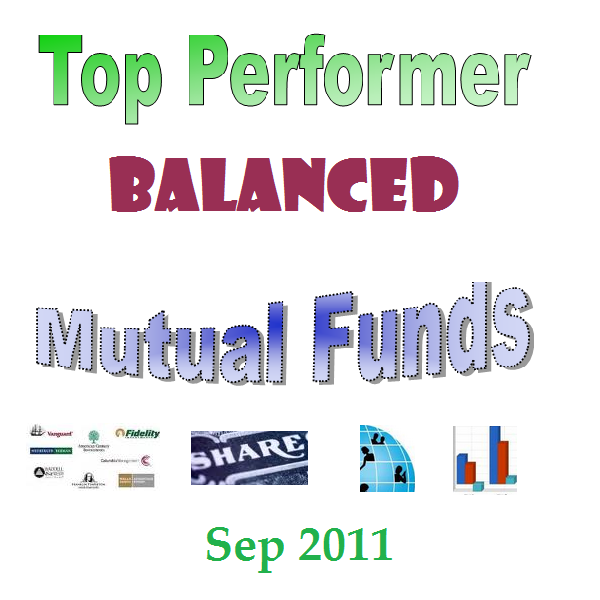 The following is about the 25 top performing balanced mutual funds September 2011. The top performers include PIMCO Real Income 2029 A, Invesco Balanced-Risk Retire 2050 A, Federated Market Opportunity A, Hussman Strategic Total Return and more. Volatility for the past 3 month has reminded us (i.e. investor) to remember to diversify our portfolio allocation. One of the easiest ways is to use balanced funds. Balanced funds or hybrid funds invest in equity and bond. Depending on their objective, these balanced mutual funds can allocate their asset accordingly. With European monetary crisis, this fund has relatively outperformed other classes of mutual funds, especially stock funds or equity funds. For a refresh, there are several balanced funds. They can be classified as: Aggressive allocation balanced funds, conservative allocation balanced funds, moderate allocation balanced funds, world allocation balanced funds, retirement income funds, and target date balanced funds (Target date 2000-2010, target date 2021-2025, etc). Invesco balanced funds dominated this top 10 performing list. These funds has majority of their asset in cash or equivalent. Investor can buy these funds through online brokerage. The minimum balance to invest is relatively low. There are two no load funds in this top 10 list: Hussman Strategic Total Return and JHFunds2 Retirement 2010 Portfolio 1. There are 5 funds with 4- and 5-stars rating in the top 10. The PIMCO Real Income 2029 A fund’s objective is to provide consistent real (inflation-adjusted) distribution. The majority investment of this PIMCO balanced fund is in inflation-indexed bonds issued by the U.S. Treasury. Rahul M. Seksaria is the current fund’s manager. This hybrid fund was introduced to public in October 2009. The fund’s dividend yield is 5.13%. Investor in this fund has just received their latest dividend distributed in August 2011 ($0.05). The annual expense ratio of this fund is 0.79% compared to the average in the Retirement Income category (0.51%). To start investing in this retirement income fund, investor can buy this fund with a minimum of $1,000 for either brokerage or IRA account. There is 0.25% 12b1 fee and 3.75% front-end sales load fee. The average maturity of this fund is 10.06 years and the average duration is 6.55 years. The other classes of this fund are Class C (PORCX), Class D (PORDX), Institutional Class (PRIIX) and Class P (PRQCX). As of July 2011, the sector allocation or breakdown of this POIAX fund is 92% in government treasury and 8% in money market and net cash equivalents. The Invesco Balanced-Risk Retire 2050 investment fund is seeking for total return with a low to moderate correlation to traditional financial market indices. It also seeks for capital preservation as the secondary objective. This Invesco fund is managed by Scott Wolle since 2009. This TNEAX fund is in the Target Date 2050+ category. The annual expense ratio of this fund is 0.25%. The dividend yield of this top performing fund is 5.19% and is distributed annually. Last year, this Invesco fund distributed dividend of $.0.43. Morningstar has rated this fund with 4-stars rating. The fund has returned 8.44% over the past 1 year, and 1.83% over the past 3 year. This Invesco fund is part of fund of funds. The minimum amount to invest in the brokerage account of this fund is $1,000. It charges 0.25% 12b1 fee and 5.50% front-end sales load fee. The other classes of this fund are Class B (TNEBX), Class C (TNECX), Class Y (TNEYX), Class R (TNERX) and Class I (TNEIX). As of July 2011, the top 2 asset allocation of this TNEAX fund is Invesco Balanced Risk Allocation fund (IBRA) 99.52%, and affiliated money market funds 0.50%. This Invesco Balanced-Risk Allocation fund’s objective is to achieve total return with a low to moderate correlation to traditional financial market indexes. This top performer hybrid fund is managed by a Scott Wolle, Scott Hixon, Mark Ahnrud, Chris Devine and Christian Ulrich. This Invesco fund has total net assets of $1.66 billion. The annual expense ratio of the fund is 1.04%. The dividend yield is 3.75% and is distributed annually ($0.47 last dividend is distributed in December 2010). The minimum initial investment of this fund is $1,000 for brokerage account. There is 0.25% 12b1 fee and 5.50% front-end sales load. The other classes of this fund are Class C (ABRCX), Class Y (ABRYX), Class R (ABRRX) and Class I (ABRIX). As of August 2011, the top 10 holdings of this fund are Australian Government Bond Future (16.46%), Japanese Government Bond Future (13.27%), German Bond Future (13.19%), UK Gilt Future (12.92%), Canadian Government Bond Swap (12.61%), Japanese Government Bond Swap (12.47%), Canadian Government Bond Future (12.19%), US Treasury Future (11.04%), UK Gilt Swap (10.39%) and Gold Future (8.16%). The Invesco Balanced-Risk Retire 2030 fund’s objective is to achieve total return with low to moderate correlation to traditional financial market indices. The second objective of this fund is seeking for capital preservation. Chris Devine has been managing this fund since August 2009. This fund has 0.25% annual expense ratio. This figure is lower compared to the average in the Target Date 2026-2030 category (0.60%). The dividend yield is 4.72%. Morningstar has rated this fund with 4-stars rating. Investor may need a minimum of $1,000 to start investing in the brokerage account of this PIMCO fund. This fund is available for purchase from 63 online brokerages. The 12b1 fee is 0.25% and the front end sales load fee is 5.50%. The other classes of this fund are Class C (TNACX), Class Y (TNAYX), Class R (TNARX) and Class Institutional (TNAIX). The asset allocation of this fund is 90.71% in cash and 9.29% in others. The holdings of this fund as of June 2011 are Invesco Balanced-Risk Allocation Institutional (99.62%), Invesco Short Term Investor Liquid Assets Institutional (0.19%) and Invesco Treasurer’s Ser Tr Prem Institutional (0.19%). The Hussman Strategic Total Return fund’s objective is to provide long-term total return (including capital and income appreciation). The primarily of the fund is invested in fixed-income securities. This fund has 5-stars return rating from Morningstar. The fund’s lead manager since its inception is John P. Hussman. He is the chairman, president and controlling shareholder of Hussman Econometrics Advisors as well as the president of Hussman Investment Trust. The annual expense ratio of this conservative allocation fund is 0.64%. This fund is in the Conservative Allocation category. The fund has 0.90% dividend yield. The minimum initial investment for investing in this HSRTX fund is $1,000. This best rated balanced fund is a no load fund. The fund uses Barclays Capital U.S. Aggregate Bond Index as the fund’s benchmark. The top 2 equity sectors allocation of this fund is Basic Materials (95.40%) and Utilities (4.60%). The JPMorgan Strategic Preservation fund is seeking for total return from a diversified portfolio of stocks and bonds. This JPMorgan fund has been managed by Talib Sheikh since its inception in March 2007. The fund’s annual expense ratio is 1.32%. The figure is comparable to the average in the World Allocation category which is 1.22%. Morningstar rated this fund with 3-stars rating. There is 0.25% 12b1 fee and 3.75% front-end sales load fee. The other classes of this fund are Class C (JATCX) and Select Class (JSPSX). The 3-year beta of this fund is -7.98. The top 5 portfolio breakdown of this fund is Foreign Governments (31.4%), Supranational (17.5%), US Treasury Obligations (13.4%), Financials (9.8%) and Telecommunication Services (6.5%). The Schwab Monthly Income Max Payout investment fund’s objective is to get current income and capital appreciation. This retirement income fund invests primarily in a combination of Schwab and Laudus funds in accordance with its target asset allocation. The fund is currently managed by Jake Gilliam. He has just started managing this fund in July 2011. The fund has 4-stars Morningstar rating. It has 2.64% dividend yield. The latest dividend is distributed in September 15, 2011 ($0.02). The minimum investment to start with this SWLRX fund is $100. This Schwab fund is a no load fund. The annual expense ratio of this fund is 0.0%. The top 5 equity sectors of this top performing fund as of April 2011 are Financials (52.49%), Information Technology (8.37%), Consumer Discretionary (8.17%), Energy (6.57%) and Health Care (5.98%).